IF THERE IS NO INDEX COLUMN ON THE LEFT, PLEASE CLICK HERE. By the summer of 1850, the pioneer era was over in Indiana. Improved land was selling for up to $25.00 an acre. In 1850 David Hartzell was 45 years old and is listed in the census as living in Waterloo township, but was probably just across the border in Jennings township. Eldest son James was now 13 years old, and youngest child William was 2. The 1850 Census says David owned real estate valued at $500, but we have not found any record of this purchase (in 1853 he buys 20 acres for $500, and in 1860 he supposedly had real estate valued at $1250). Head of household: David Hartsell, occupation Shoe Maker. Eliza J., born around 1840, must have died in the 1850's. Celestia was to be born in 1852 (gravestone). Elizabeth was to be born in 1855. The census taker in 1850 traveled west on farm road 150N in Waterloo township. He turned south on the then dead-end farm road 325E, which ends at the border of Jennings township, then returned to 150N to continue west. Then he turned south on farm road 250E to the border of Jennings township, returned to 150N and continued the census. David Hartzell apparently lived along the present-day farm road 325E in the southeast quarter of Section 16 of Waterloo township, or at the end of the road but inside Jennings township. In 1850 this road dead-ended at Jennings township and was 1/2 mile long. The Census shows Christian and Augustus Brown as living along this road, with David next (south of them). Augustus Brown was a shoemaker (like David), and this is very interesting. David may have been living on the land he was to buy in 1853, or near it. If the former, it is extremely possible the census taker would have mis-listed him as being in Waterloo township. Daughter Celestia Hartsell was born in 1852. Her name is shown as Salesta in the 1870 Census. She was called "Aunt Let". Her gravestone says "Mary C.". On August 27, 1853, David Hartzell bought 20 acres of land in Jennings Township from Mr. & Mrs. Jonas Scholl for $500 (Deed Record Book R, page 243). 8 acres were in the northeasternmost corner of Section 21, and the other 12 acres were adjacent and in the northwesternmost corner of Section 22. See Appendix for directions to this land and for the actual recorded deed with detailed dimensions. The drawing below is 1 square mile. The location of the other presumed 20 acres is unknown. The land David Hartzell bought in 1853 was visited in 1983 and 1997 by JDH. On the west end of the 20 acres there was a fenced-off square. In this square was the ruins of a house and an old well. The house fell many years ago and was almost completely decayed into the ground. Square nails were in the boards, thus dating it before 1880. In 1983 JDH retrieved a piece of a roof beam. In 1997 there was virturally nothing left. The well, about 25 feet deep but probably filled in some, is 3 feet in diameter and lined with flat rocks. It is around 30 feet east of the house, and in 1997 a fence surrounded it. The gully farther east was a possible trash dump used by the people living here. There is what appeared to be a gate and "driveway" on the northwest corner of this homesite. 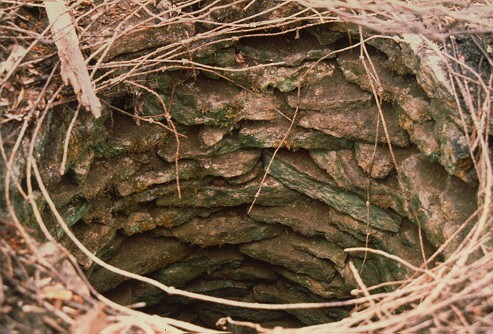 The fact that there is a well means that someone lived here. This site has probably survived all these years because it might have not been practical to tear down the fence and cut the trees to gain a little more ground. 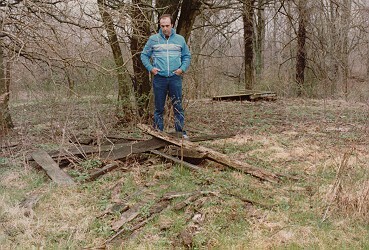 JDH at David Hartzell's possible homesite in 1983 In SW corner of 20 acres, looking east. Covered well (shown below) is in the background. In 1983, a farmer by the name of Chester Phlug, living north of the land, said there used to be a log cabin back in that corner. Check the ownership history of this land in the Appendix and judge for yourself whether this homesite was the home of David Hartzell and his family. The nearby creek was surely an important water supply. If you visit this site, go in late winter after the snow melts and before the weeds (and poison ivy) get too high. The name of the 1997 owner is in the directions to the land in the Appendix. You should get permission to walk across the field. Let's try to picture the scene in 1850. Let's make it late autumn. Try to visualize pictures you've seen of frontier people and houses before the Civil War. David Hartzell and his family were very likely living on the land he was to buy soon in Jennings Township. He had 6 children and was now 44 years old. Barbara was 34. Eldest son James A. Hartsell was now 13 and not attending school (normal in those days), according to the Census. It is difficult in modern times to picture what life was like. Picture yourself being poor and living in a two or three-room primitive cabin in the damp, cold woods. There is no plumbing, no sinks, no bathroom. The "sink" is a bowl on a table. No TV, no radio, no telephone, no electricity. Furniture is very basic. Beds are wooden and possibly homemade. Several sleep in the same room. In the morning when you wake up it is very cold in the cabin. Someone lights a kerosene lantern. Someone starts a fire in the cookstove or pot-belly stove over in the corner. You can smell the smoke from the fire and the burning kerosene. You go outside to the outhouse to go to the bathroom. You wash your hands and face in a washbasin filled with water that was carried from the well. The dirty water is dumped outside. You take a bath once a week or so. The clothes you put on are ragged and probably still dirty from the last few days. If you're going to school you walk on dirt roads that are often very muddy. Travel is by walking, on horseback, or by horse and buggy. There are penned up horses, and probably cows, pigs and chickens. By 1856 a railroad passed about a half mile of their house. They could hear the new sounds of a steam locomotive. (Sarah) Elizabeth Hartzell was born Nov. 24, 1854 or 1855. She did not remember which year, and her mother had not written her birthdate in the Bible like for the other children. However, her gravestone says 1855. She is listed as Elizabeth in the 1850 Census, was known as "Aunt Sade", and her gravestone says "Sarah E.". On May 6, 1858, at the age of 21, James Alexander Hartsell married (Mary) Elizabeth Palmer, age 21, in Connersville. The wedding ceremony took place in the same church and by the same minister as his father and mother 22 years before. The bride was born February 1, 1837 (derived from gravestone), and was to live only 8 more years to the age of 29. She is not our ancestor. At the time of his son's marriage, David Hartzell was 52 years old. Rebecca Ann Hartzell married Timothy Small in August, 1858. She was 18 years old. Barbara Hartzell, sister of James A., married Samuel Walker on Feb. 3, 1859. She was 16 years old. We think Samuel was Joseph's brother, and he was 36 years old at the time of the marriage, 20 years older than Barbara. Samuel's father William Walker died 3 months later on May 17, 1859. We thought we had thoroughly accounted for all of David Hartzell's children (spouse and where buried), but "forgot" the 9-year old girl named Eliza J. Hartsell in the 1850 census . She isn't in the 1860 census (at age 19), which means she died, or married, or moved away before 1860. TJP's grandfather's notes and my grandmother's notes don't mention her, which implies she died young or wasn't their daughter. Of the children of David and Barbara Hartsell, Thelma's grandfather Harry Hartsell's 1925 notes do say "one died in infancy". This could be Eliza J., and "infancy" might have been what he thought. It is also curious that David & Barbara named a later daughter born in 1855 "Elizabeth". She was listed as Elizabeth in the 1860 census, but later went by Sarah Elizabeth (Aunt Sade). Makes you wonder if they named her after deceased Eliza, and whether Eliza died between 1850 and 1855. We really don't think Eliza grew up and married. also Susan, age 42 in household, born Penn. - mother? others age 5-18 - brothers and sisters? Frederick Hartsell, Marion County, Wayne Twp, age 65, born 1785 in PA.
Margaret Hartsell, Marion County, Indianapolis Twp. Note that in 1840 there was an Adam Hartsell in the same township. Wife Delilah is not listed; died about 1848-49? Teany, age 33   nickname for Christena? Handwriting for "Teany" also looked like "Frany" or "Trany" or "Tiany'. By 1850, "Uncle" George Nipp had moved to Decatur County, Indiana, just south of Rush County. Head of household: William Walker, occupation farmer. John Walker        age 22  born in Indiana, $1000 real estate, $1400 poss. Using the 1850 Census & 1856 Plat Map and following the census taker's route in 1850, William Walker (age 73) was not living on his land in Waterloo Twp section 18, but somewhere on the land he bought in 1821 and 1828 in Jennings Township . The SE 1/4 of Section 21 (1821 purchase) has a creek, so this would have been a good spot to build a house. 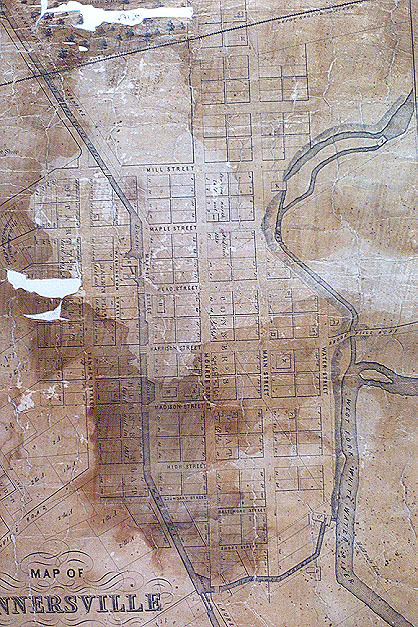 The 1856 plat map shows this part belonging to son Samuel Walker, future husband of David Hartsell's daughter Barbara. Another possibility is the other adjoining part, the SW 1/4 of Section 22 (1828 purchase). 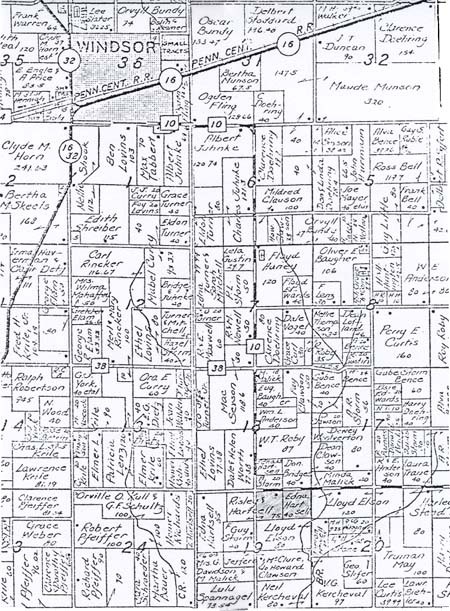 The 1856 plat map shows this part belonging to son John Walker. The plat map doesn't show a road to this land. William was listed as head of household along with wife Jane and sons Samuel, John & William Jr., so there is a good chance this is where he lived the whole time. Head of household: Joseph Walker, occupation farmer. Joseph, born in 1814, should be 36. Not known who is Edward or if he died young. Sophronia should be 14 mo. Amos was not yet born. Using the 1850 Census & 1856 Plat Map and following the census taker's route in 1850, Joseph Walker (age 37) was living in Waterloo Twp section 15, probably on brother James' land in the NW 1/4. Since there was a road along the south edge of this land, he probably lived along this road. In 1856 he had land in Waterloo Twp section 11. Joseph Walker's wife Sarah, mother of Sophronia, died June 11, 1851 after 3 years of marriage. She was 26 years old. Sophronia was 4 days short of being 2, and Amos under a year old. William Walker's wife Jane died June 15, 1855 at the age of 72 years, 6 months. She is buried at Springersville Cemetery (4 miles east of Connersville), Fayette County, Indiana. 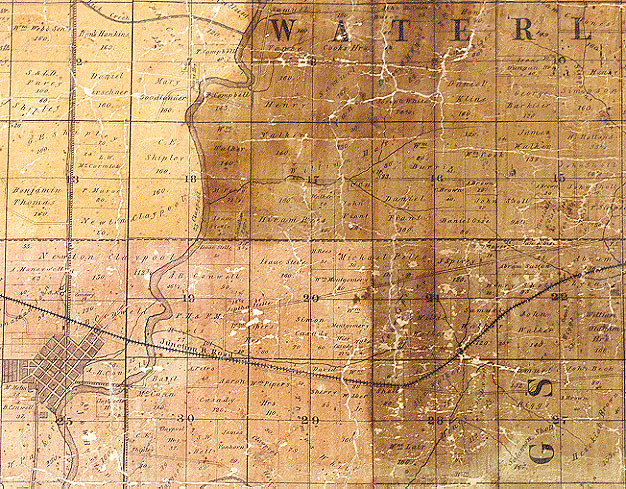 In 1856, Joseph Walker owned 30 acres in Section 11 of Waterloo Township. His brothers had land nearby. His father William Walker owned 160 acres in Section 12 of Harrison Township (all in Fayette County). On May 17, 1859, Joseph's father William Walker died at the age of 82. He is buried at Springersville Cemetery. See extracts of his will in the Appendix. He may have been like a father to David Hartzell. In 1859, probably after his father died, Joseph Walker settled permanently in Shelby County, Illinois (he had been there before in 1842, and bought land in 1849). His daughter Sophronia, future wife of 22 year old James Alexander Hartsell, was now 10 years old. and is on the next page. The parents must have died. births of George and Thomas (if they were Thomas's children). This one was difficult, but using the 1850 Census & 1856 Plat Map and following the census taker's route in 1850, the orphaned Dorsey children seem to have been in Waterloo Twp section 17, probably on Henry Walker's land in the NW 1/4, and along the south edge where there was a road. They also could have been on adjacent Wm. Walker's land in the NE 1/4 of Section 18. Remember Joseph Walker married Sarah Dorsey in 1847, and in 1840 Thomas Dorsey, the children's father, was listed 4 names before Henry Walker. By now, Illinois was quickly moving forward, but as late as 1855 the area around Mattoon (and Windsor) was virtually devoid of settlement due to lack of a railroad. Actually, we know there were a few hardy pioneers in Shelby County that came as early as 1825. The first locomotive arrived in Chicago in 1851, and in 1855, the railroad extended from Chicago to Urbana, thus finally opening this previously inaccessable area. Stations were put down with a water tank and windmill every 10 miles, and new towns were springing up around them. In 1855, traveling south from Chicago, Kankakee had 1500 people, Ashkum was a water tank, Onarga had 10 houses, Loda was one farmer living in a tent, Ludlow was just prairie, Rantoul was a patch of timber, and Urbana-Champaign had 2200 people. To the south, including Mattoon, there were only scattered settlers. Windsor was founded in 1856. In 1858 the railroad had pushed through to the Mattoon area. It was now that this area began to be settled heavily, and the town of Mattoon began to emerge. The year before, there wasn't much here. The Osage Orange (Hedgeapple) tree was introduced about this time by a college professor named Turner as a means of fencing the prairies into school districts. The tree was popular among the farmers. Some example of prices - chickens were still a dollar a dozen, eggs were 4 cents a dozen, beef was 7 cents a pound, a 19 pound turkey sold for 50 cents, and flour was $3.50 a barrel. In 1858 novel agricultural implements were being exhibited at Springfield: plows mounted on an axle with a seat, a circular harrow, hand machines for washing clothes, and a chain-bucket pump. The first care of a new settler was to provide for the first winter. He planted Indian corn in tough upturned sod in a slit made by an axe. Then he built a house. After that he could begin to break up the rest of the land. Hog and hominy was frequently the only food a settler had the first year. 1856 Connersville, shown below, is from the 1856 plat map in the Fayette County Courthouse. A railroad now follows the route of the old Whitewater Valley Canal. The West Fork of the Whitewater River is now some distance east, but at Water Street the land drops to where the riverbed once was. Today's courthouse is in the same location as the courthouse of 1856. The street at the top is Mill Street, now called 8th Street. The street at the bottom is Short Street, now called 1st Street. The street along the river on the right is Water Street. 3 blocks left is the canal, and the next street is Tanner, now Western St. The town of Connersville is on the lower left, alongside the Whitewater River. Many of these roads still exist today. In 1840 David Hartzell lived along the road in north-central Sect. 28, on Alex Walker's land. 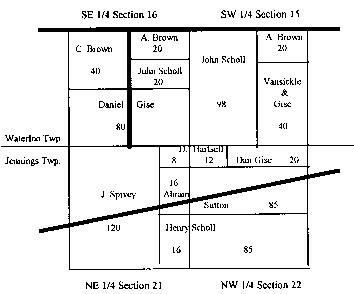 David Hartzell's 1853-63 land is in the top right corner of Sect. 21 and top left corner of Sect. 22. The Junction Railroad passed about 1/2 mile south of David's land. Springersville is at the NE corner of Section 23. The Springersville Cemetery (many Walker burials) is just NW of Springersville. There was a church near west-central edge of Sect. 15. There is still a church on east-central edge of Sect. 22. William Walker's 1821 land purchase is the SE 1/4 of Sect. 21 (Samuel Walker in 1856). William Walker's 1828 land purchase is the SW 1/4 of Sect. 22 (John Walker in 1856). in 1850 William Walker was living along the south edge of his 1821 land purchase. In 1850, Joseph Walker was living in NW 1/4 Sect. 15, along road at south edge. There is other Walker family land all over this map. Thomas Dorsey's 1835-37 land was part of the NE 1/4 of Sect. 4 (north of Sect. 9). In 1850, the orphaned Dorsey children were living at west-central Sect. 17, on Walker family land. The town of Alquina is one mile south of SE corner Sect. 27. 1860 is a very interesting year. We have reconstructed a great deal on what happened in this year. It is very lucky that the Hartsell family was still in Indiana when the Census taker came calling. This is the year of the family's move to Shelby County, Illinois. We don't know why they decided to move - we can only guess. One possible reason was that the Civil War was imminent. Another is that close family friend Joseph Walker had already settled permanently in Shelby County the year before, and may have recommended it. He had come back with his two children ages 9 and 11. The new location was 235 miles away, a long distance in those days. It had to be painful for David & Barbara Hartzell to leave behind their daughter Barbara (now married to Samuel Walker). It is also curious that David Hartzell did not sell his 20 acres until 1863. They certainly could have used the money. Perhaps he thought he'd be coming back. Moving in order to obtain land could not have been the reason because James Alexander Hartsell did not buy land until 1872. The Illinois central railroad, eager to bring farmers into the east-central area, had been advertising heavily, and this area had opened up for the first time to the grain markets of the north and east. Still, it still seems most likely it was because of the impending Civil War - perhaps Joseph Walker, who was an avid reader and was well informed, saw what was coming and talked the Hartsells into moving. At the time of the Census taker's visit, David Hartzell was 54 years old (but shown as 52 in the Census), and still listed as living in Jennings township, and owner of $1250 worth of land. Curiously, he was now listed as a farmer, not a shoemaker. Also very curious, as will be explained below, they were not on their land, but 3 miles to the south in the area of the town of Alquina. David Hartsell is now listed as a farmer instead of shoemaker. David's age should be 54. Barbara Hartsell's age should be 44. Unlisted daughter Rebecca, age 20, is now married to Timothy Small. Unlisted daughter Barbara, age 16, is now married to Samuel Walker. Sophronia, age 11, was the future wife of James Alexander Hartsell. Joseph's wife Sarah Dorsey had died June 11, 1851 at the age of 26. Edward Walker (born 1846) is not listed; he was not Joseph's son. Elizabeth Hartsell was James's first wife. The handwriting on the 1860 census is very hard to read, but it supplies an interesting implication that David Hartzell, James A. Hartsell, and Joseph Walker were not on David's land, but south on farm road 450E, in or very near the town of Alquina. Without the 1856 platt map, we would have assumed he was still living on his land. (Remember that David Hartzell didn't sell his land until 1863). To target where they were when they were enumerated, here are some clues. The 1860 Census, along with the 1856 platt map, shows certain people listed after David & James Hartsell who are also on the platt map south of Alquina: Isacc Loudenback, ? Hull, and Leonidis Ross. People listed before David & James Hartsell, with land north of Alquina, are Jacob Scholl, Jacob Reibsomer, George Lyons, and James Abernathy. This puts our family in the immediate area of Alquina. Maybe they were in a staging area for the move to Illinois. Fascinating! Joseph Walker and his children Sophronia and Amos. Rebecca and husband Timothy Small. David's daughter Barbara is the only one we know of who stayed behind. She was now married. The families had packed their belongings into wagons and were leaving Connersville for a new future in Shelby County, Illinois. Try to imagine what this caravan looked like. It must have been in July. Eight adults (counting Margaret), and seven children ages 5 to 13. Joseph Walker was probably traveling light, having already being settled in Illinois, but there must have been 3 household's worth of furniture. Think what they must have taken with them. Foodstuffs, tables, chairs, cupboards, heating woodstoves, dishes, pots & pans, bedding, clothes, tools and maybe a plow, the children's toys, and even family heirlooms (like the old Bible). There had to be at least 4 wagons. Plus, the usual mode of travel in those days was to tie a spare team of horses to the back of the wagon, and switch horses periodically to give the pulling horses a rest. This was a major event in our family history. From Connersville the family most likely headed north for 12 miles to connect with the National Road which would take them to Illinois. This road was formerly unhewn trunks of trees laid side by side and held together by slips nailed across the ends. By 1860 the road was considerably improved with a macadamized surface. Along the way, the only "big" towns they saw were Indianapolis and Terre Haute, with populations less than 20,000. It is hard to imagine what this 235 mile trip by horse and wagon was really like. It must have taken at least 6 days (at 40 miles per day). All their possessions in their wagons, their food & water, probably cooking over a campfire, and sleeping out in the open or in tents. They had to contend with rain and who knows what else. Here is something related by Edith Neal, daughter of Elizabeth Hartsell Walden (Aunt Sade): The family came to Illinois in wagons. Two of James A. Hartsell's younger sisters, one of them "Aunt Sade" - about 6 years old, were yelling "Hurrah for Lincoln" while going through a town in Indiana on the way to Illinois in 1860. Their mother (Barbara Hartsell) admonished them with "Don't make trouble". The other sister must have been Celestia. You can read all kinds of things into this. The children must have heard the parents talking, and they must have been in an area of Southern sympathizers. Lincoln wasn't President yet but they knew about him. Joseph Walker probably talked a lot about Lincoln and the slavery situation. The children must have been high-spirited and not suffering much so far on the trip. The National Road brought them into the small town of Effingham, Illinois. The route north from here to the Windsor area (16 miles) was probably a dirt road along the railroad tracks established by the railroad crews about 5 years before. There were no telephone poles along the tracks at that time, of course. The townsite of Windsor at this time may have been just a water tank with a windmill to pump the water, put down by the railroad company. Pioneer farmers bought the land first near these stations where the trains would stop. The area around Mattoon and Windsor was brand new country where most of the land had not yet been turned by a plow. In these early days, the area had low stagnant marshes and many mosquitoes. Quinine sat on the table like the sugar. There were fights and gunplay in town. The nearest "large" town was Champaign-Urbana with a population of 5,000. Chicago had a population of 100,000 people and was actively involved in the shipping industry. 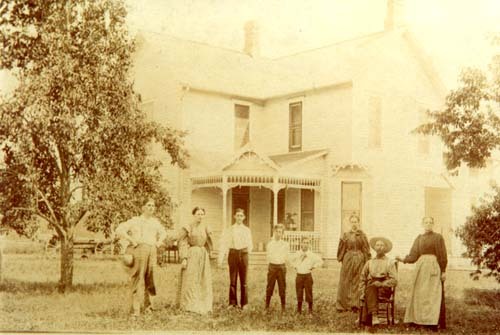 Thus here it began, the longtime Hartsell family home, started in 1860 when James A. Hartsell was 23 years old. Here in Richland Township he rented land for the next 12 years. In 1861, when the Civil War began, James A. Hartsell was 24 years old. There is some evidence that after the 1860 move to Indiana, David & Barbara Hartsell along with their younger children lived with Joseph Walker (see 1870 Joseph Walker census record). On September 15, 1863, David Hartzell sold the "1853" 20 acres in Fayette County to Richard Sithens for $500. 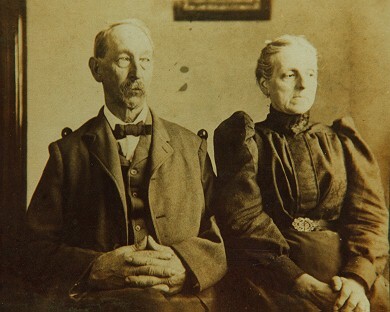 The land record said David and Barbara were "of Shelby County, Illinois". No record of the other land, if there was any, has been found. On March 5, 1865, the year that President Lincoln was assassinated, David Hartzell died at the age of 59 years, 3 months, and 13 days. He was buried at Ash Grove Cemetery in Ash Grove Township, Shelby County, where the first burial had taken place 7 years before in 1858. The ages of his sons and daughters at the time of his death were: James - 28, Margaret - 27, Rebecca Ann - 25, Barbara - 22, William - 17, Celeste - about 14, and Elizabeth - 10. A year later, on February 25, 1866, Mary Elizabeth (Palmer) Hartsell died at the age of 29, 8 years after marriage. She is also buried at Ash Grove Cemetery. There were no surviving children by this marriage. On December 23, 1868, James A. Hartsell, age 31, married Sophronia Walker, age 20. A month before their marriage, baby Mary Elizabeth Hartsell was born Nov. 29, 1868 (derived from gravestone). One would think that in those days this was a great family embarrassment, but TJP's mother remembers clearly a family story that the baby was lying on a quilt on the bed during the marriage ceremony, so it wasn't something they tried to hide. On August 21, 1870, Mary Elizabeth Hartsell died at the age of 1 year, 8 months and 22 days. She was buried in the Ash Grove Cemetery. Think of the grief James A. Hartsell went through during this five year period. First his father in 1865, his first wife in 1866, and then his first child by his second wife in 1870. As a side note, there was a marriage in Rush County Indiana (next to Fayette County) between William Hartzell and Catherine Vickey on Jan. 1, 1862, and a burial of Nellie Hartzell, daughter of William & M. Hartzell who died May 12, 1865, age 7 mo. 2 days, in the Raleigh (Zion) Cemetery, Washington Township (Rush County). Joseph Walker is covered above in the Hartsell section. In 1860, Connersville had a population of 140 families, totaling 596 people. Abraham Lincoln was nominated by the Republican Party in 1860 and he was inaugurated on March 4, 1861. Although slavery became illegal in Illinois in 1848, it was not until the outbreak of the Civil War that Illinois was recognized as a "Northern" state. Illinois supplied 250,000 Union solders and became a major weapons manufacturing center. In 1861, Abraham Lincoln became President of the United States. This same year the Civil War began. Trainloads of soldiers from Chicago passed through Mattoon and Windsor on their way to the south. Injured and dead soldiers were going north. Immigration of new settlers virtually stopped during the war. The 123rd Illinois Regiment was armed and awaiting orders in Mattoon in September 1862. These were men from the Mattoon/Charleston area. They were later camped at Louisville, Kentucky and were commanded by Colonel James Monroe. Buffalo were still plentiful on the plains west of the Mississippi River in 1868. Ulysses Grant became President in 1869 and was in office until 1877. In 1869 the Transcontinental Railroad provided the first railroad link to the west coast. Around 1870, (Mary ) Celestia Hartsell married Alex Walker. There were no children. Alex was blind as of retirement. He was still living in the 1920's (DVH). James A. 's mother Barbara was a live-in housekeeper for Joseph Walker. At the age of 38, and four years after J.A. Hartsell's marriage to Sophronia Walker, a daughter was born. She was Minnie Alberta Hartsell, born May 15, 1872. Three years later William Webster was born, on July 5, 1875. In still another 3 years, Oma Estella Hartsell was born April 8, 1878. As related by DVH: James A. & Sophronia Hartsell rented land in Richland and Ash Grove townships prior to 1872. He and Sophronia lived on a farm east and south of the Ash Grove Church, reckoned by DVH to be in the SE 1/4 of the NE 1/4 of Section 8, Ash Grove Township. The house was back off the road about 1/2 mile east of the crossroad just south of the church. They were living there as of March, 1870 and presumably until 1872. On February, 29, 1872, James A. Hartsell purchased 80 acres of partly improved land in Ash Grove Township from William Jordan at $34.00 per acre ($2720.00). This was 12 years after he came to Illinois and it was his first land purchase. These 80 acres are located on N.1/2 of NE.1/4, Section 19, Township 11 N., Range 6 E. It is 3 miles south of Windsor. The west 40 acres belongs (still?) to Bertha Juanita (Hartsell) Risley, while the east 40 acres belonged to Edna (Dietz) Hartsell until her death in 1982. The east 40 acres contained (and still does as of 1998) a timber, and a creek flows alongside it. James A. Hartsell's sister Rebecca Ann (Hartzell) Small died April 8, 1874. She was buried at Ash Grove Cemetery. Barbe Hartshel is Barbara (Nipp) Hartzell, widow. Marget (Margaret), William, and Salesta (Celestia) are Barbara's children. It is unknown who the child Joseph is. The Great Chicago Fire occured in 1871. The year 1876 saw Custer's Last Stand, and Chicago got it's first telegraph poles and gas lights that year. The memory of Lincoln was still strong during this centennial year. On January 22, 1880, Barbara (Nipp) Hartzell, mother of James A. Hartsell, died at the age of 64. She was buried at Ash Grove Cemetery next to her husband, David Hartzell, who had died 15 years earlier. The 1880 Mortality Schedule for Illinois gives her age as 64, born in Virginia, widowed, parents birthplace unknown, occupation unlisted, died in January. See 1880 Joseph Walker for Margaret Hartsell. On October 22, 1881, James Oran Hartsell was born to James A. (Age 44) and Sophronia (age 32) Hartsell. He never knew his paternal grandparents. Two more sons later followed, Sherman Donnell Hartsell, born May 24, 1886, and Harrison Marine Hartsell, born September 28, 1888. James A. Hartsell was now 51, and Sophronia was 39. James A. Hartsell continued to add to his land holdings, paying from $16.25 to $40.00 per acre. In addition to his own children, he reared and educated several whom he adopted, among them Almira Lawton, whom he reared from 6 to 21 years of age. For 4 or 5 years his sister Margaret, who never married, lived with them. Barbara Hartsell, daughter of David Hartsell, is buried at Union Cemetery (also called Lyonsville Cemetery) with her husband Samuel. Lyonsville, IN is just south of Springersville (Fayette County, Jennings Twp.). Notes by Wm. Webster Hartsell show Samuel P. Walker born July 28, 1822, died Aug. 21, 1888; Barbara A. Walker born Oct. 30, 1842, died Sept. 18, 1897. He mentions the "western & central part" of the cemetery. A gravestone list at the Connersville library shows Samuel R. Walker born July 29, 1822, died Aug. 2, 1883; Barbara A. Walker, born Oct. 30, 1842, died Sept. 13, 1897. I tend to believe Wm. Webster's notes. The 1881 bio. says that in 1884 Joseph Walker gave up farming and moved into the village of Windsor. He was 70 years old. DVH says that "great grandfather Joseph Walker had lived across the street and east 1/2 block from where he lived in Windor in the 1970s - 420 N. Chestnut? The census says both of Joseph's parents were born in England. ?? Joseph was born in Ohio. Note that Barbara (Nipp) Hartsell died in Jan. 1880. Note that Margaret Hartsell was in the household in 1870. Samuel Walker, husband of Barbara Ann (Hartsell) Walker, died Aug. 21, 1888. He is buried at Union Cemetery, south of Springersville, Fayette County, Indiana. In 1896, James A. Hartsell, now 59, built a home at the north edge of NE 1/4 of Section 18 in Ash Grove Township. The family setting at the time of the construction was: Eldest daughter Minnie Alberta Hartsell was 24 and in 5 years time will marry John Hart. William Webster, age 21, had gone off to college to study law. Oma Estella Hartsell was 18, James Oran Hartsell was 15, Sherman Donnell Hartsell was 10, and Harrison Marine Hartsell was 8. Father-in-law Joseph Walker died the same year. James' sister Barbara, who had remained in Indiana, died Sept. 18, 1897. Burial was in the Union Cemetery just south of Connersville. Joseph Walker died April 8, 1896, in Windsor, Illinois. He was 82 years old. He is buried in Ash Grove Cemetery, Shelby County, Illinois. See extracts of his will in the Appendix. Daughter Sophronia inherited $2174.76 about 2 years later, on June 19, 1898. James A. & Sophronia Hartsell Date unknown. 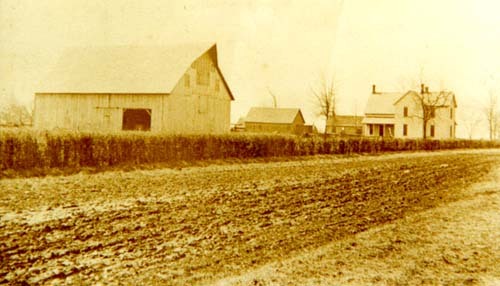 James A. Hartsell's farm Date unknown. James' brother William died in 1905. "Mr. Hartsell has always been a staunch Republican and cast his vote in the Township. He is a self-made man in the truest sense of the word, and his success in the various operations has been hard earned and well deserved. He bears the reputation of a man of sterling integrity and has many warm friends in the Township where he has made his home so many years". James' sister Margaret died July 16, 1922. James' sister Mary (Celestia) died in 1924. Sophronia (Walker) Hartsell died March 7, 1926. JDH's dad has recollections of his grandmother Walker: "When we were were young and playing outside, Grandma always knew when we were hungry and would bring something out for us to eat. We really liked her." James' sister Sarah (Elizabeth) died Oct. 10, 1940.